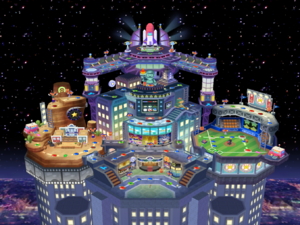 Neon Heights is an American-themed board in Mario Party 7 set atop a skyscraper complex. It is largely based on Las Vegas, Nevada, and to a lesser extent, Hollywood, California; Cape Canaveral, Florida; and New York City. It is complete with a theatre district, a movie set, a space center, and a baseball diamond. There is also a Mario statue that resembles the Statue of Liberty. Here, Shy Guys are in charge of the attractions, while Top Hat Shy Guys are in charge of the Orb Shops. On this board there are three Treasure Chests, which appear in random spaces. If a player reaches a chest, Koopa Kid offers to open it for 10 coins. One chest contains a Star, another 20 coins, and the other one contains a Bob-omb, which blasts the player back to the start. Once the Star has been purchased, three new chests appear. This board may have been under secret control of Bowser, because he and Koopa Kid claim that the chests and Stars belong to him. Additionally there is a toll gate, where Koopa Kid stops players to ask them to pay 10 coins to take the path he is blocking. Wario shooting Koopa Kid boards. There are many ways to earn coins here. The first is an area that players always come to at the start of the game. It is a movie set, and every time players come by, the Shy Guy director asks if they want to try out for a part in his movie (there were different roles for different characters). Accepting lets them play a coin game, where they have to shoot as many of the 15 Koopa Kid targets as possible. However, they must avoid shooting the Toadsworth targets, as doing so ends the game and leaves the player with nothing. When time was called, he gives a comment about how they did, and coins equal to the total of Koopa Kid targets they shot down. Since the player has 10 seconds to shoot the Koopa Kid targets, the total number of coins they can get on one turn with that is 15 coins, provided they shoot all the Koopa Kid targets. On the opposite side is the baseball field. Here, a Shy Guy with a bat challenges players to a home run contest. Accepting lets them play a coin game where they had to hit the baseballs that is thrown out of the shooter. When time is called, the Shy Guy gives a compliment for how well the player did, and two coins for every ball they knocked out of the park. At the top of the board is the rocket ship. When players land on the Green Space in front of it, a Shy Guy comes asking if they want to "shoot for the stars". Accepting lets the player pump fuel into the rocket until time is called. Then, the player enters the ship, and starts to travel upward into the starry sky, collecting coins along the way, and possibly even a Star if they make it to the top. The last way to get coins is landing on the Green Space in the middle of the board. Here, a Shy Guy lets players play a matching game, where they have to match as many panels as they could before they miss to get coins. Matching all the panels makes Shy Guy award the player with a Star, but if they picked the Bowser panel, Shy Guy reluctantly took 10 coins away from them. 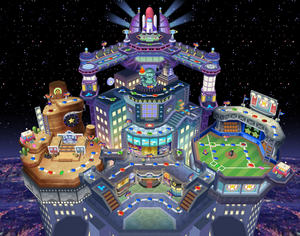 The Green Space near the Mario statue and to the right of the elevator above the baseball field, makes a UFO come and scramble the locations of the chests. 46, 48 if there is a single treasure chest left. 30 at the start of the game, 36 if there is a single treasure chest left. Takes a souvenir photograph of all the players, and made them pay 10 or 20 coins each for it. Then, he leaves without giving anyone the photo. Steals coins from everyone and put them in the chest that contains 20 coins. Takes away a Star from the player in first place and put it in the chest that contains a star. Therefore one of the chests contains 2 stars. Places a Dark Star in the chest that contains the Bob-omb. Players who find it lose a star. 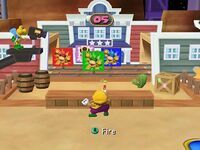 In Solo Mode, players have to beat their opponent by getting three out the five Stars that were in five of the eight chests on the board (three of them had Bob-ombs) first by having Koopa Kid open them for a price. However, Koopa Kid always charged 5 more coins for every chest he opened. The baseball game is very similar to Dinger Derby, a minigame from Mario Party 5. When Toad or Toadette are playing the shooting Koopa Kid game, they stand on a stool. When playing the shooting game, Shy Guy will say he is looking for an actor for a hero, heroine, sidekick, or villain role depending on the character playing the game. This page was last edited on January 12, 2019, at 13:19.